A little over a month ago, I was approached to be a part of partnership opportunity with TownePlace Suites by Marriott for their 2016 "Military Spouse Squad" Blogger Ambassador Program. D and I have been Marriott Rewards Points travelers since living abroad with the military, so I felt the partnership to be quite the serendipitous one...especially with our pending cross-country move this summer! Being a military family, we're no strangers to traveling, staying in numerous hotels for long periods of time, and trying to make the most of locations we aren't familiar with. Thankfully, extended-stay hotels like TownePlace Suites exist to help make our travels with the military (and for fun!) so much easier. For our Orlando adventure last weekend, we were visiting Walt Disney World for one last jaunt around the parks before we're no longer Florida residents. Sad!! While we love staying on Disney property, sometimes we like to opt for more space, amenities, and a lower price point without straying too far from the parks. 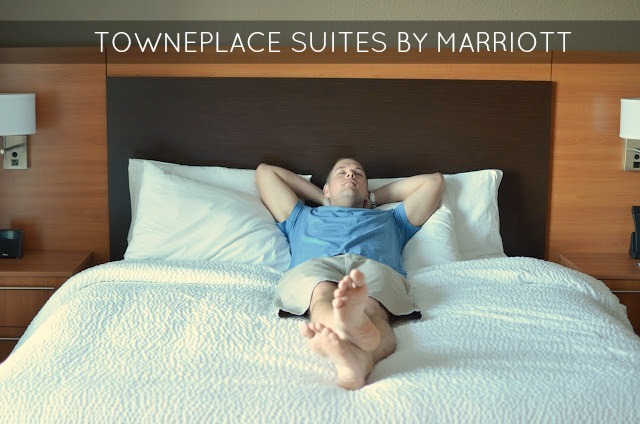 When we heard TownePlace Suites had just opened a new hotel outside Disney's West Entrance this past February (making it a Disney Good Neighbor Hotel), it was a no-brainer! With amenities like free HOT breakfast, plush bedding, and speedy on-line check in, we felt right at home with Towneplace Suites Orlando at Flamingo Crossings for our 2-night stay. Upon arriving, we were highly pleased with the beautiful, modern design and the overall layout of the room. Plenty of space for our luggage and room to move around without feeling cramped. We always love having an in-room fridge to store snacks and bottled water, so having a FULL KITCHEN at our disposal was even more of a bonus! D was quite impressed with the amount of closet space our Studio King room had. He's big on hanging up his clothes to avoid wrinkles while we travel (that military boy). Happily there was also a iron and ironing board in our room. As for me, a fluffy bed with lots of pillows is always my favorite part of a hotel stay. TownePlace Suites made this 6-month pregnant lady very happy by having extra pillows on hand for my finicky sleep habits. Needless to say, we were happy campers all around. Customizable elfa closet system through their partnership with The Container Store. Spacious Suites with more than enough room for luggage and a few family members. Giant TowneMap of local area in lobby with neighborhood tips for dining. Local area brochure guides in room (in participating locations). Pool and outdoor green space available. 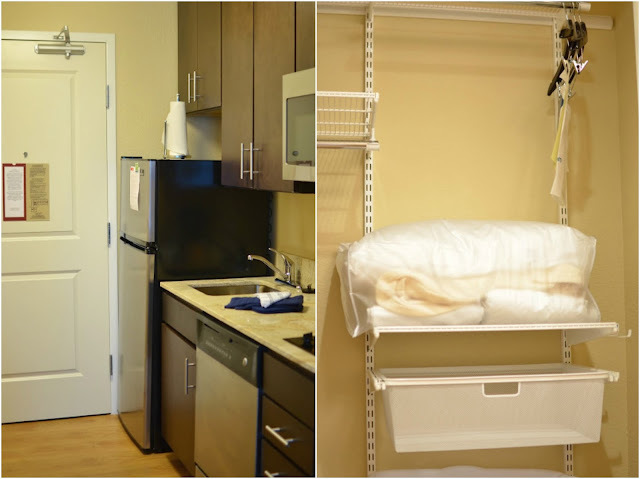 Laundry facilities and fitness center on site. With a large portion of TownePlace Suites located near military bases (and attractions that appeal to military and civilian families alike), this extended-stay brand is dedicated to supporting the military community and making life away from home a little easier. Now that we've had a taste of the good life, D and I looking forward to a handful of TownePlace Suites stays in cities across the USA during our Florida to California road trip next month! Stay tuned! Connect with TownePlace Suites via Facebook and Twitter! It looks like a really nice place!